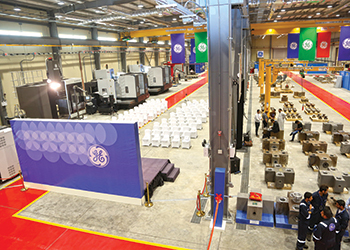 GE oil & gas has inaugurated the first phase expansion of its pressure control manufacturing facility in Dammam, Saudi Arabia, part of a wider GE vision to create new economic and social value for the kingdom and its people. The expansion triples the manufacturing capacity of advanced pressure control technology at the company’s multi-modal Modon (Saudi Industrial Property Authority) facility in Dammam Second Industrial City, supplying wellheads and advanced flow control solutions that are critical components in driving productivity and operational efficiency, all made in Saudi Arabia. Testing and repair service capabilities are also enhanced with the expansion. One of four global GE wellhead manufacturing centres of excellence, the ‘One GE Oil & Gas’ Modon site is the subject of an ongoing multi-million dollar development programme to establish GE’s largest advanced manufacturing facility in the region, extending manufacturing and services capabilities across the GE Oil & Gas portfolio including Measurement & Control, Subsea Systems, Turbomachinery and Artificial Lift solutions. According to GE Oil & Gas, the expansion also supports the corporate goal of achieving 70 per cent localisation in Saudi Arabia by strengthening local manufacturing, supply chain, service capabilities and talent development. By manufacturing in Dammam, the company says it can more effectively and efficiently respond to the needs of local and regional customers and partners, such as Saudi Aramco, while also aligning with the kingdom’s strategic objectives to boost domestic manufacturing and export capacities. 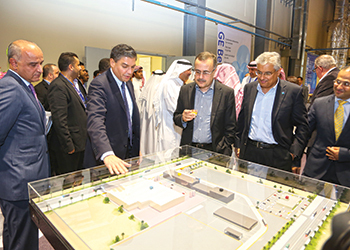 Speaking at the inauguration of the 10,500 square metre facility, GE Oil & Gas president & CEO Lorenzo Simonelli told Oil & Gas News that the project continued GE’s legacy of supporting Saudi Arabia’s oil and gas sector since the 1930s. "This expansion is yet another demonstration of the company’s ‘say do’ philosophy in Saudi Arabia. We make a commitment and stand by it. That’s true of the products and services we provide. That’s true about the statements we make about serving the kingdom. We’re not here to make bold statements, we’re here to follow through on our commitments. "This project is part of a wider phased expansion programme at the site to serve our local customers and partners, including Saudi Aramco, and build on the unique long-term partnership we have with the kingdom. Without the strong partnership with Saudi Aramco, this expansion project would not be possible." The expanded Dammam facility is also expected to generate new jobs for Saudi nationals, with the potential to triple the workforce on site as the product base grows. Currently, 70 per cent of the more than 170 employees at the plant are Saudi nationals. During the inauguration ceremony, Amin Nasser, president and CEO of Saudi Aramco, said the significance of GE’s Dammam manufacturing investment lay not only in the services it will provide Aramco and the wider Saudi energy sector, but also the statement it makes about GE’s enduring engagement with Saudi Arabia, as well as the degree to which the kingdom represents an appealing destination for foreign direct investment. "The greater localisation of content within our supply chain is a major strategic objective for Saudi Aramco. In addition to purchasing goods and materials produced here in the kingdom, our focus on in-kingdom value addition also involves procuring a wide range of services domestically. This new facility helps us achieve both of those objectives since it incorporates manufacturing, testing and repair activities within the same plant. It also shortens our supply chain, reduces lead times for procurement and allows us to maintain lower levels of inventory this plant will also create good career opportunities for Saudi citizens, further enhancing the broader economic impact of this facility and GE’s total investment in the kingdom." According to GE, the Dammam expansion meets its technical and environmental, health & safety standards. Furthermore, it is certified to ISO 9001:2008 for quality, ISO 4001 for its environmental management system, OHSAS18001 for occupational health and safety, and American Petroleum Institute (API) 6A/Q1 standards.